Breathtaking Direct OceanFront to IntraCoastal living at it's finest. Sip your coffee watching the glorious sunrise and then celebrate the great day with happy hour on the west balcony enjoying the multi colors of the sunset. 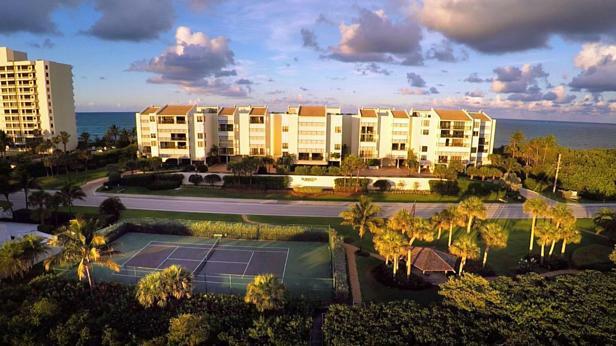 Miles of beautiful beaches for surfing, swimming and fishing and IntraCoastal waterways for paddleboarding, boating, kayaking and jetskiing and then enjoy a swim in the pool and spa to cap off the day. This most sought after ''A'' Floor plan offers a large kitchen with ample countertops and sliders to an oversized balcony, wet bar with formal dining area and generous living room, a lavish master suite, newly remodeled baths and large walk in closet. The guest bedroom has a private bath and walk in closet as well. A small pet under 25 lbs is welcome. #ComeJoinUs! I found this listing at 19670 Beach Road #a304 in Jupiter and would like more information. Thank you.